It’s been a while since we’ve had some Japanese food, hasn’t it? This is kind of weird – it’s totally delicious, but not something you see in the US so….sorry about that. Branch out. It’s song-of-my-people type of stuff, because I like to think that I’m Japanese, so you just have to deal with it. 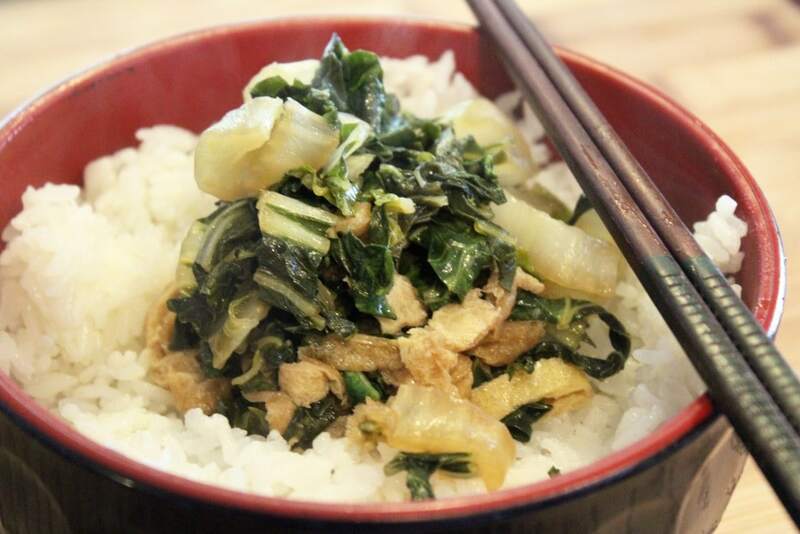 Also, it’s healthy and yummy so…you can be Japanese too! 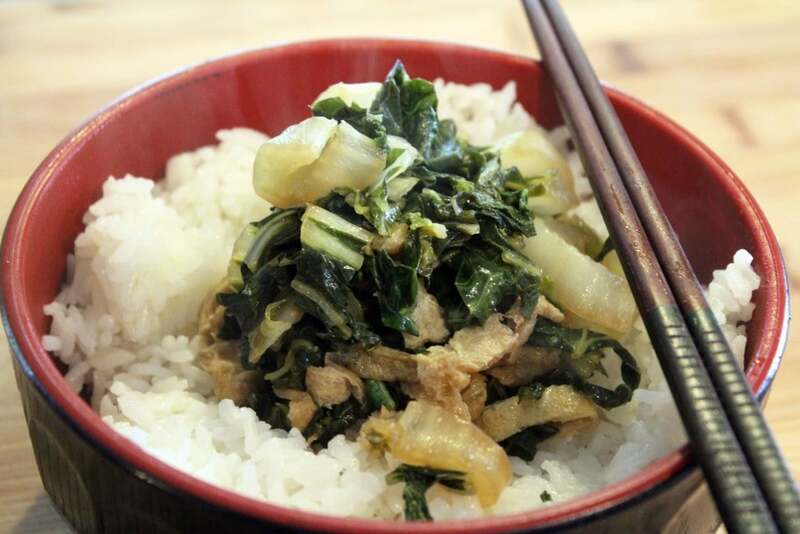 My mom used to make this all the time when we lived in Tokyo, and it was a nice kid dish – salty and included fried tofu but made with a whole head of greens. I loved it, and I still do. If you leave out the dashi this is vegan, too – otherwise it’s a lovely vegetarian dish that kind of can be a meal. Oh, and. 5 ingredients. Massive flavor. Here’s what you need! 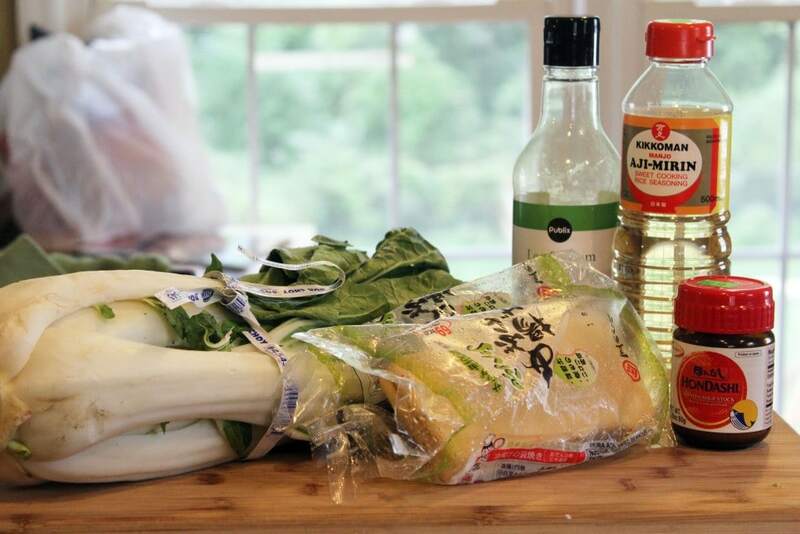 Bok choy – one whole head, or any other kind of greens you like. Fried tofu – you can find this lots of places in the freezer section – I’ve seen it at regular grocery stores and Asian markets in our little city so…you probably live somewhere bigger and cooler than I do. You also need dashi seasoning, flakes, OR fish sauce (just something that tastes salty and fishy, even anchovy paste), soy sauce, and mirin. That’s it! Mirin is sweet cooking rice wine and you need it in your cabinet if you don’t have it already. It’s cheap. You’ll love it. 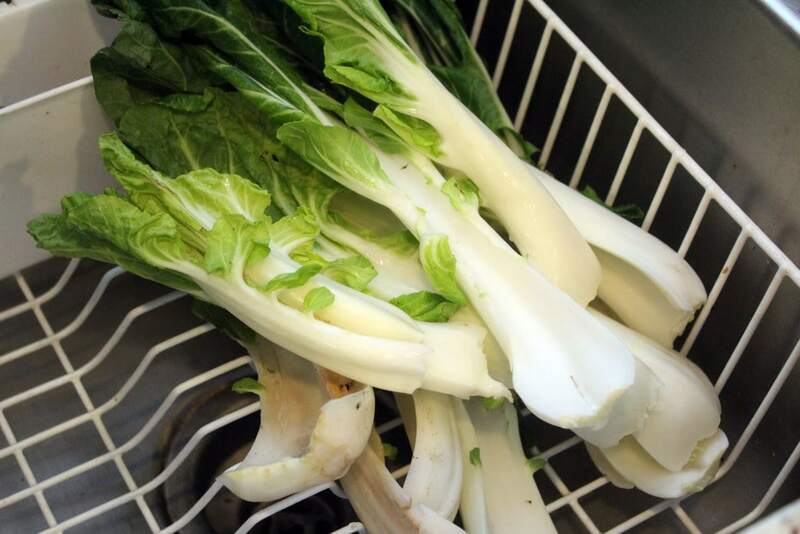 So first, we wash the bok choy. What I love about this is bok choy is kind of a soft green, so you don’t have to braise it for hours and hours like collards. It absorbs all the soy flavor really quickly, and keeps a nice crunch. 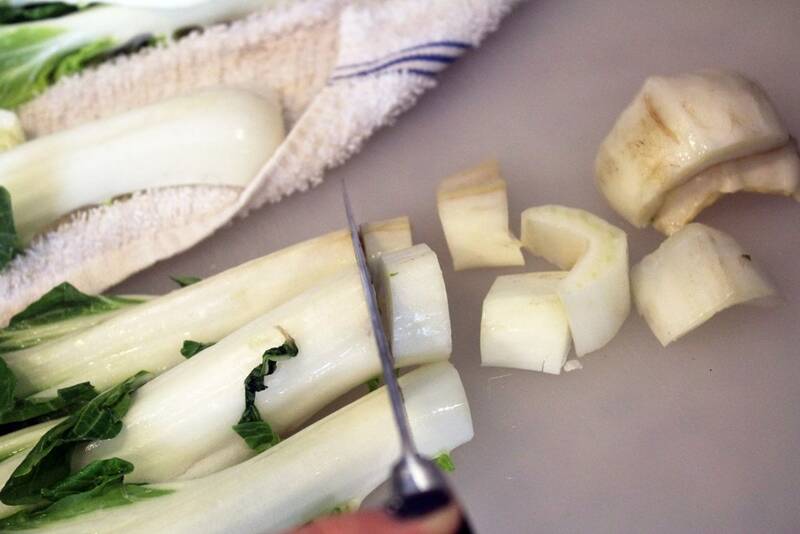 Cut off the ends of the bok choy, then slice the white parts and the green parts – we use it all! Separate the white and green parts, and preheat a pot or skillet with a lid to medium heat with cooking spray or a drizzle of oil. 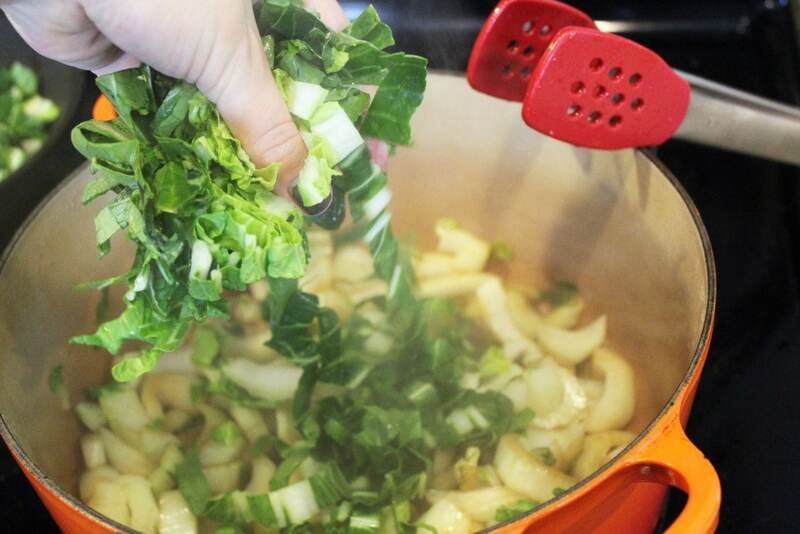 Add the white parts of the bok choy to the pot – just to give ’em a head start. Then, add the seasonings! 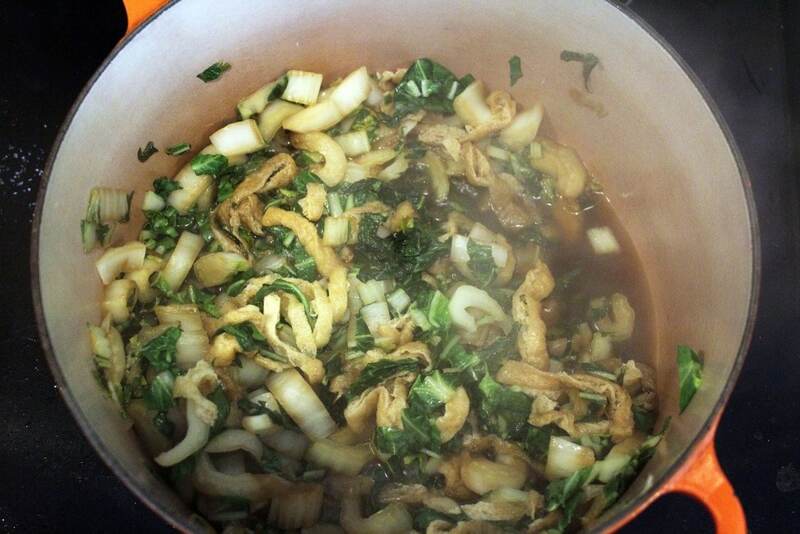 1/2 teaspoon of dashi, and equal parts mirin and soy sauce – 2 tablespoons each to start. 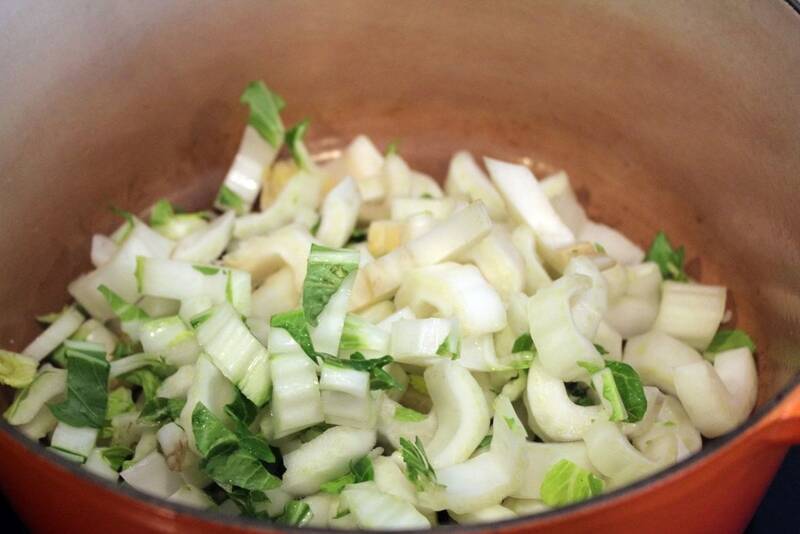 Cover the pot and let the bok choy whites braise for 5 minutes over medium or medium-low heat if the liquid bubbles quickly. While that happens, thinly slice 1 or 2 slices of fried tofuy. When they’re kind of cooked, the green’ll look like this! Then, add the rest of the bok choy and the tofu. Stir everything together and cover the pot for 5 more minutes until the greens have started to soften slightly. Taste the greens, and add more soy sauce or mirin if you’d like. The fish flavor should be present but not overpowering. It’s SO dang good. That’s it, guys. 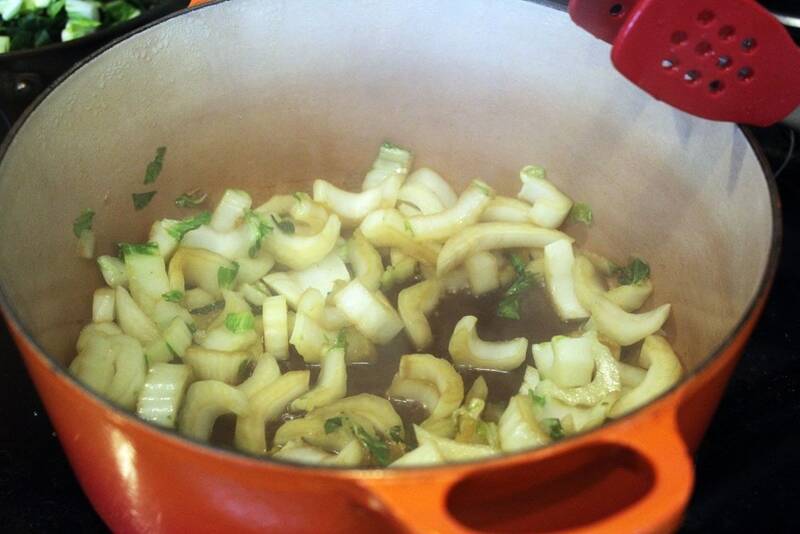 A really nice side dish that you can use as part of any Asian-style meal. 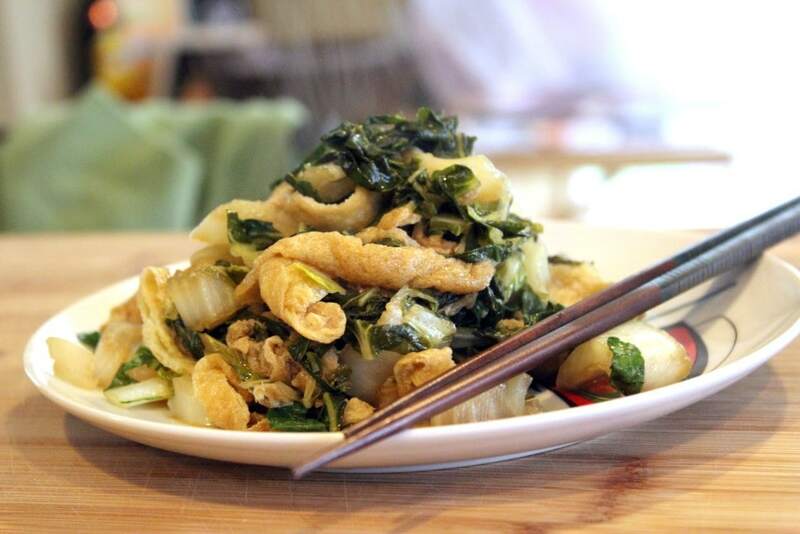 Or, you can let this be the main dish – it’s got tofu and veg in it, after all! I love these heaped over rice. The sauce gets all in the rice and YES. You will seriously love these. Make them soon! Preheat a skillet with a lid or a pot to medium heat with a drizzle of oil. 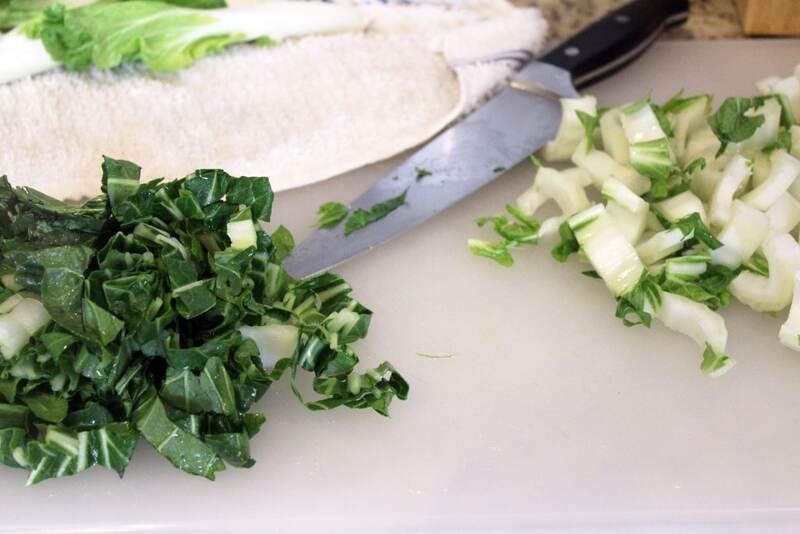 Thinly slice the bok choy leaves, separating the whites and greens. 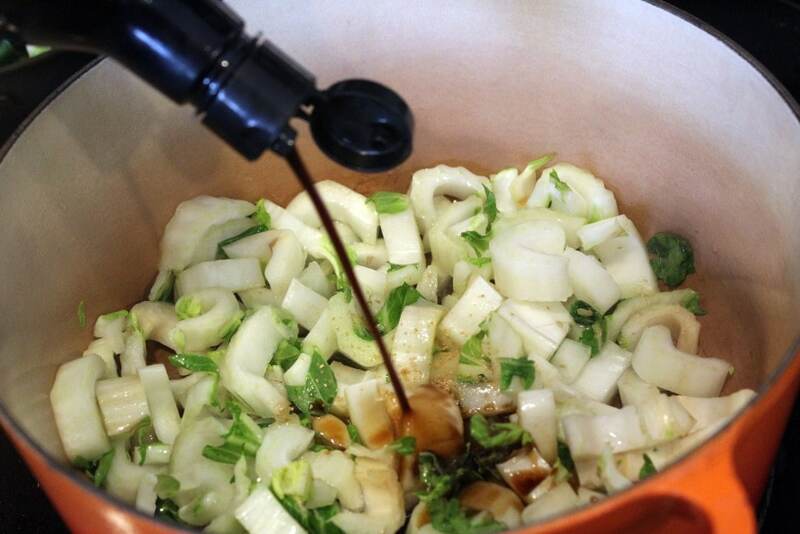 Add the whites of the bok choy to the pot with the dashi, soy sauce, and mirin. Stir, and cover. Let cook for 5 minutes until slightly cooked. Add the greens and the tofu to the pot. Cover, and cook for 5 minutes more until the liquid has been partially absorbed and the greens are soft. Taste, an add more soy sauce if you'd like. Serve with white rice. Submitted to Weekend Potluck, via my girl Tonya.